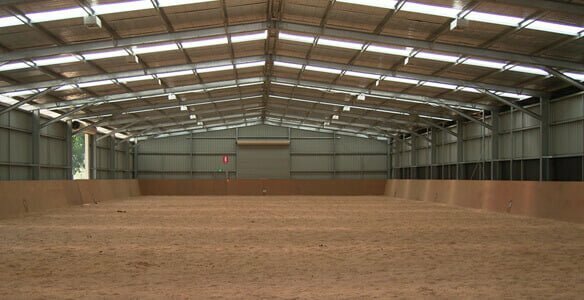 In the Perth area, it is not uncommon to use the templates of sheds to build an arena for you and your horses to exercise and play in. When thinking of building this type of unit, you want to make sure that you can get the very best. For example, if you build garages right the first time, they will last you for many years and serve their functions for you and your Perth animals. When it comes to the arenas we build, you don’t need to worry. We make sure that they are made to last and we design them just the way you want, with the best materials and complete warranties. When you build arenas or any kinds of storage sheds, you want to make sure that you get exactly what you need or want for your Perth home. With our all-encompassing customisation process, you can discuss the specifications that you want your arena to have and make it truly your own. There are a number of features that can add to the lifespan of your unit, such as extra insulation, which also serves to help regulate the temperature of the arena. Although totally optional, extra features can be added to increase the durability of the roof, fences and railing. While we do note that all of our units are built to last, we do know that life happens sometimes. Bad weather and unforeseen circumstances could cause wear and tear on your arena that would cause problems down the line. This is no cause for worry however as we have warranties to cover just this. As with most of our sheds, we offer a 10 year structural warranty and a 15 year cladding one to provide extra protection to your unit. Therefore, even if the worst happens, you won’t lose your precious arena. When building a shed you want to make sure that you get the best one possible. Using only the most substantial materials in the industry, we allow you to design and build an arena exactly the way that you’d like it. Also, even if the worst should happen, our warranties guarantee that you won’t be without an arena so that you and your horses can enjoy it for a long time. To learn more about designing and building your arena, call 1300 778 628.